In June 2016 I was lucky enough to take part in one of our projects in the Galapagos as a conservation volunteer. Unfortunately the project was too brief for my liking, as already just after a few hours I was hooked! I was collected from Puerto Baquerizo Moreno and driven the short drive into the Highlands, the rocky and hilly interior to San Cristobal island. It was great to leave the coastline and climb up into the Highlands, as we were afforded amazing views out over the island and the dramatic coastal scenery. Our destination was a rural farm on the outskirts of a pretty little village, from where the conservation project is run. The conservation volunteer project is run by a dedicated family who have lived in this area for many generations. They are passionate about conserving this wonderful area that they live in, and work closely alongside the national park authorities to protect this area. 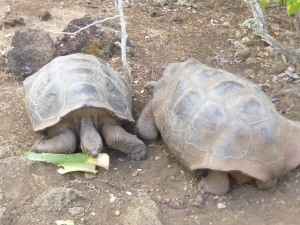 They have dedicated many years to eradicating alien vegetation, planting indigenous plants and helping to protect and conserve the giant tortoise population living locally. Our day started early to avoid the heat, heading up to the top of their land with dramatic views over the sea. With us we carried some saplings which had been grown within the national park tree nursery. At the top of the hill (a slightly challenging affair, but well worth it for the views!) was a shed where all of our tools and equipment were stored- we thanked our lucky stars that we hadn’t had to carry it all up with us! We grabbed some spades and water and continued our walk out to our planting site. We were planting indigenous bushes along the border of the national park land. 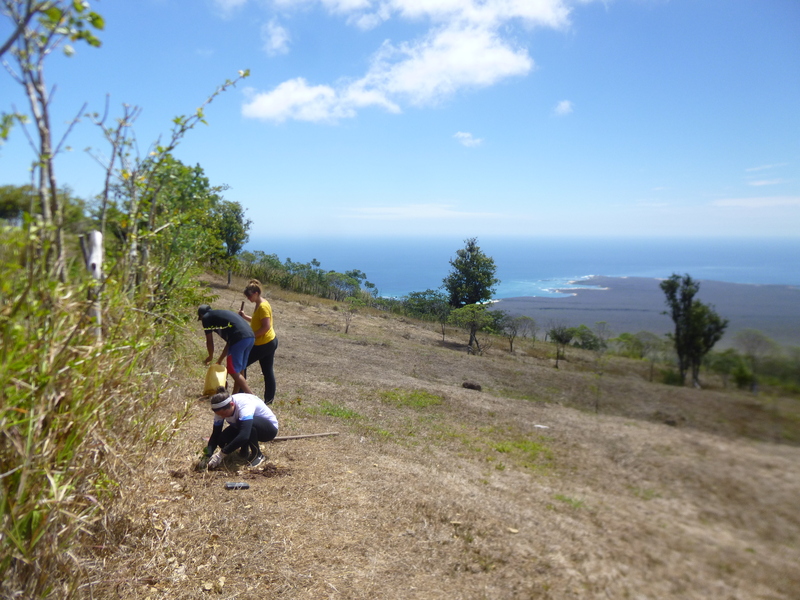 This planting encourages the growth of endemic species, which is better for both the plant and animal life on the island. We spent the morning digging holes and planting our saplings, giving them plenty of water to ensure that they survived. It was hard yet rewarding work, and it was great to take a step back and see all that we had achieved after several hours of work. Due to the heat, the working day finishes in time for lunch, and we had a lovely walk back to our accommodation before preparing some grub. We made a huge pot of pasta, working outside is tiring work! In the afternoon we had some free time, so we hired a local driver to take us further up into the Highlands. 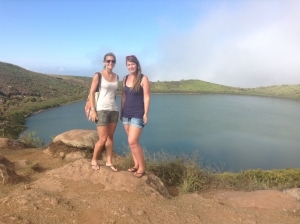 Here we walked up to a wonderful lagoon, visited the giant tortoise rehabilitation centre (this is often visited during your time as a conservation volunteer) and went to a beautiful beach littered with basking sea lions. It was a wonderful afternoon out, and offered a great contrast and understanding for the work that we were doing on the project. 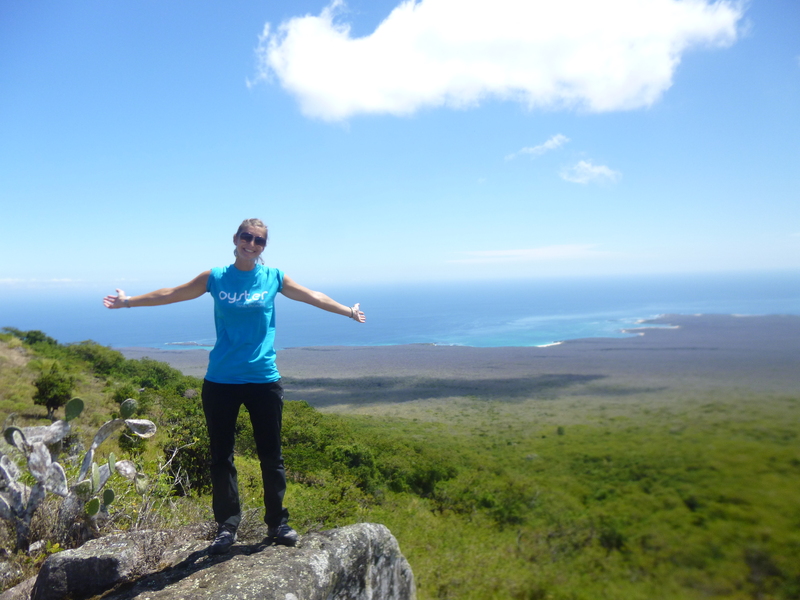 To find out more about this conservation volunteer project in the Galapagos, check out our Galapagos volunteering page. Next Post What do past participants have to say about Oyster?